Kahrs Hardwood Flooring with Woodloc® The biggest innovation since Kahrs invented engineered parquet. 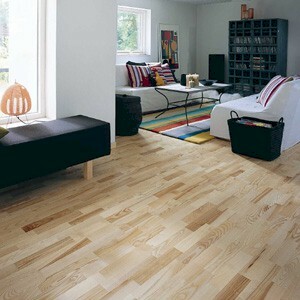 In 1941, Gustaf Kähr was granted a patent on the multi-layer parquet board, the world’s first engineered parquet. The construction made Kahrs hardwood flooring more stable, and also utilized the raw material in a new way that gave greater consideration to resources. Much has happened since then, of course, but the next really big step in the history of hardwood flooring was when Kahrs introduced the woodloc joint. This mechanical glueless joint locks boards together with almost invisible joints. The rows of boards align themselves automatically, without the need for gluing. The Woodloc joint gives perfect results that withstand tough use and last throughout the product’s lifetime. And thanks to the glueless installation, the boards can be lifted at a later date and re-laid elsewhere. Whichever product you choose, you can be sure of one thing: You'll own a style created by nature and crafted using the very best technology, with total respect for the environment. Original Collection - From calm and rustic Oak to colorful and vibrant Cherry. The American Traditionals - a good choice if you want to give your home a classic, yet colorful look. The Boardwalk Collection - This collection consist of a range of bi-colored planks, which have been brushed to create their special character. Classic with a twist is the feeling they wanted to create with the truly unique Boardwalk Collection. Each plank in the range is uniquely colored and brushed to achieve the right look and an exquisite texture. Presidents Collection - When you look at these planks you can sense the wing-beats of time. With great care, they have taken century-old oaks and applied all their knowledge into crafting a timeless product, once that enhances modern qualities while maintaining an original feeling. Castle & Cottage Collection - Recalls the authentic charm of days gone by. This collection offers you the choice of maintaining the rhythm of a classically refined traditional pattern or creating a more modern, architecturally dimensional space. Studio Collection - For Glue Down and Staple Down Installation - Studio planks with personality. Mega Studio planks of pure elegance. Every planks is unique. Just like any part of nature. Linnea Collection - From calm to rustic, make your pick among many different woods. Beautiful to the eyes, appealing to the touch. The Linnea Collection combines the aesthetic with the practical. The planks are durable, simple to install and easy to maintain. With the Linnea Collection they have made beauty more sensible and affordable. Wood is a natural material which, during the first few months, matures to its natural color. This characteristic underlines the beauty and character of real wood. To produce an even surface, rugs should not be laid on thesurface during the initial months after installation. If there are already light patches from carpets etc, these will mature when they are exposed to daylight. It is advantageous to move or rearrange rugs, furniture, etc. periodically to avoid defined lines between the exposed and unexposed surface. From the forest to the home. It's amazing to think that the acorn that fell to the ground and took root in the eighteenth century is today a fully-grown oak, ready to be felled. All trees are felled selectively; an old prudent and ecological method. New trees are planted to replace those felled, which guarantees that there will be beautiful, new well-managed forests for future generations.